Incorrect water temperature is a key risk factor for legionella growth. The legionella bacteria multiplies in water at temperatures between 20 to 45°C, particularly if a supply of nutrients is present, such as scale, rust, sludge or algae. A typical method of control is to store cold water below 20°C. Hot water should be stored above 60°C and distributed at above 50°C. The immersion probe should be placed in the water to a minimum depth of 25mm. The ribbon surface probe may be used to take the temperature of pipes and tanks, and the wire probe can be used to reach awkward places or where the other probes are not appropriate. 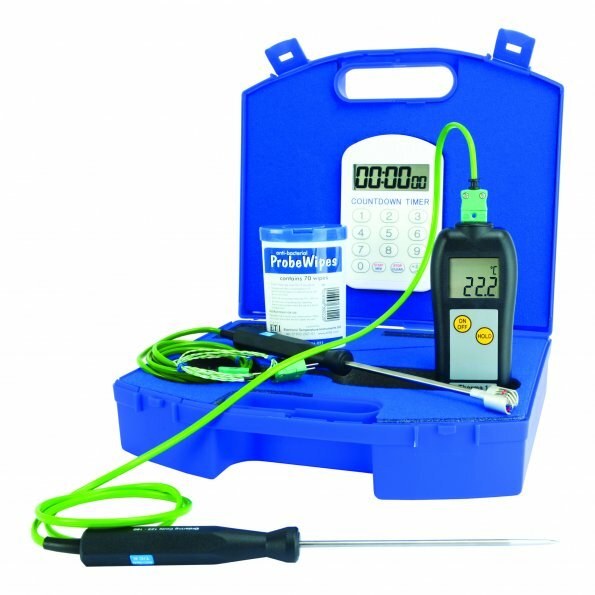 The surfaces of the Legionella thermometer use Biomaster technology to reduce the risk of bacteria growth to help safe guard the user. Biomaster Antimicrobial Technology is the leading range of safe, effective and permanent additives for the control of harmful bacteria, making any surface cleaner and more hygienic for its entire lifetime. Proven to quickly reduce bacteria by up to 99.99% Biomaster is an effective means of reducing the growth of MRSA, E.Coli, Salmonella Campylobacter, Legionella and over 50 other species. Each Thermometer Kit comes with a free traceable calibration certificate. Please enquire for full specification. Thermometer will monitor temperature of water and surface pipes and tanks that form part of the water system. Supplied in durable plastic case.